Place romaine lettuce in a large mixing bowl. In a jar, mix together balsamic vinegar and olive oil. Pour over the lettuce. Mix well until the lettuce is covered in the vinegar-oil mixture. Add to the salad the cheese, apples, and walnuts. Toss. Top the salad with your sliced leftover steak. Enjoy! You can use whatever cheese you like--blue cheese, feta cheese, ricotta cheese, etc. You can also use a different kind of fruit and a different kind of tree nut. You can substitute the leftover steak with whatever meat you may have had the night before. 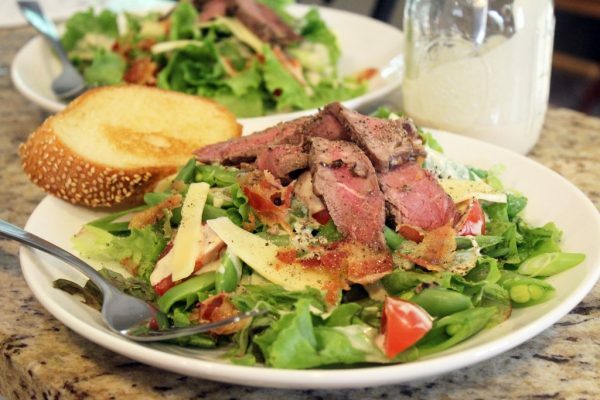 Make the salad your own!